Usually my WIAW days are recorded on Sundays or Mondays, which are my off days. This time I almost forgot about recording my eats again but thankfully I still had Tuesday! So this time my eats are for yesterday, which is my internship day (one of three). Gonna jump right in! Thank you to Jen for hosting again. Lovely Jen. 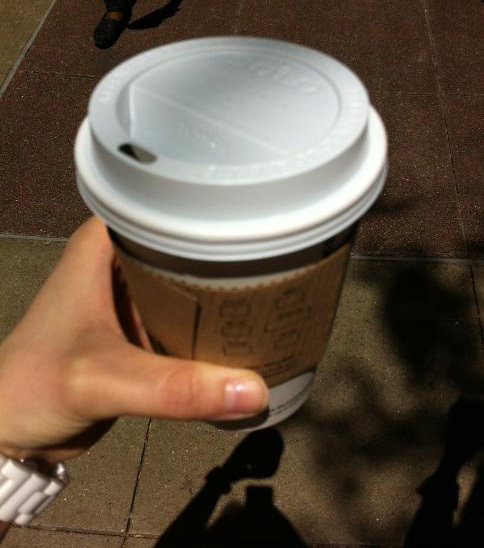 For breakfast, I had my usual-ish. 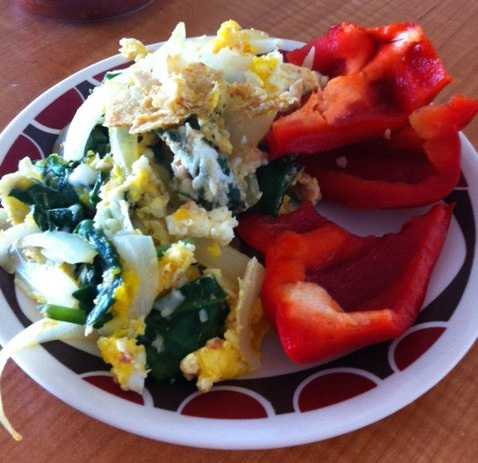 One egg and one egg white with onions and spinach. Red peppers on the side. Mmm. 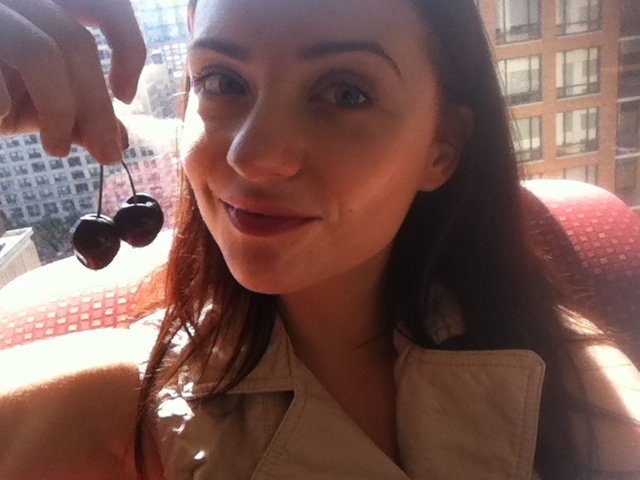 For early lunch, I brought some cherries with me to the internship from home. They were on sale at the grocery store and they taste delicious! Perfect sweetness/tartness! Score! We stopped by the Farmer’s Market nearby too to sample some berries and cherries from the vendors. After the internship, I got home and was a little hungry again so I made myself an applesauce, greek yogurt, and high fiber cereal concoction which I haven’t had in quite some time. It was yummy. Today is cardio day of Curvalicious and I decided to do the recommended 20 minute HIIT instead of a fitness class I normally would opt for. I don’t know why, I didn’t feel like waiting till 730p to do piloxing and I didn’t feel like doing spinning for a full 60 min anyway. So I opted for HIIT for 20 minutes with 45 minute intervals of walking at 4.0 and then running at 7.0 with some variations within that whenever I needed a longer break. It was my first time doing HIIT in over a year and I have to say I actually LIKED it. This is huge for me because I am not a cardio person. 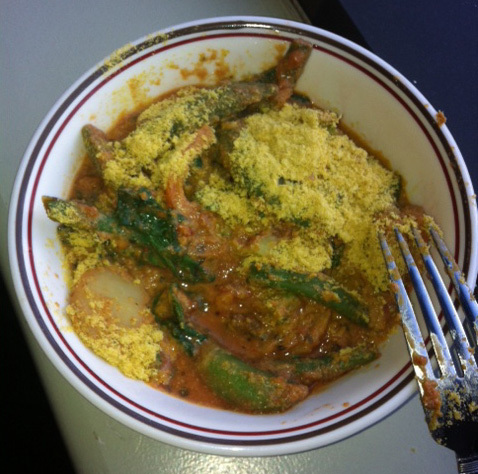 🙂 When I got home, I made my latest dinner obsession: stir fry veggies with spaghetti sauce and nutritional yeast flakes. Oh my gawd, this is heaven in a bowl. Yes, I realize it looks kinda gross on a picture but it looks better in person. And boy, does it taste yummy! That ice cream bar sounds so yummy! 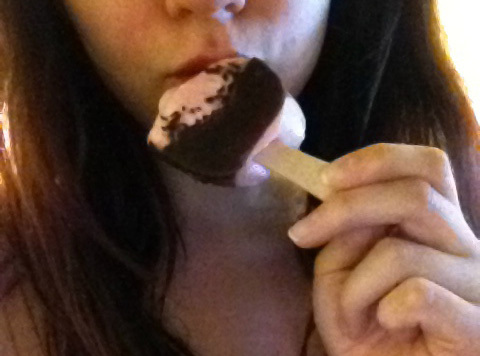 I love chocolate dipped strawberry anything! I’ll have to hunt those down! I have to say, of everyone I know, you manage to eat the healthiest foods!! And not much sugar in any of it is quite amazing! I will have to do the same.. summer and swimsuits are on their way!! Aww thank you! The more I look at the pic, the more I think it looks horrible hahah. 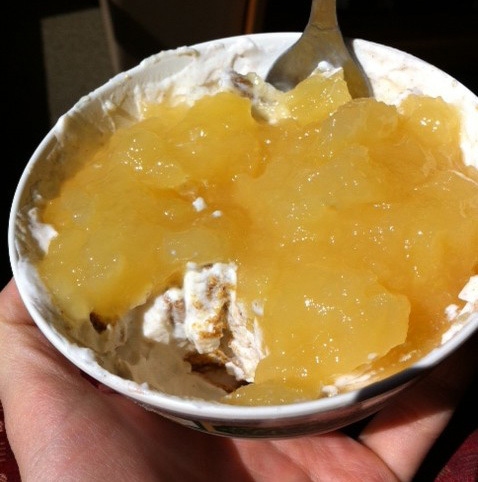 I like the idea of adding applesauce to a bowl like that with the other tasty items, I will be trying that soon! I just saw cherries at the grocery store last night, and I’m kicking myself for not buying any. <3 those! Oh man, go back and buy them now!! Cherries are so good right now! The perfect flavor combo! Lots of fruits and veggies…Ok by me! Great looking eats girl! 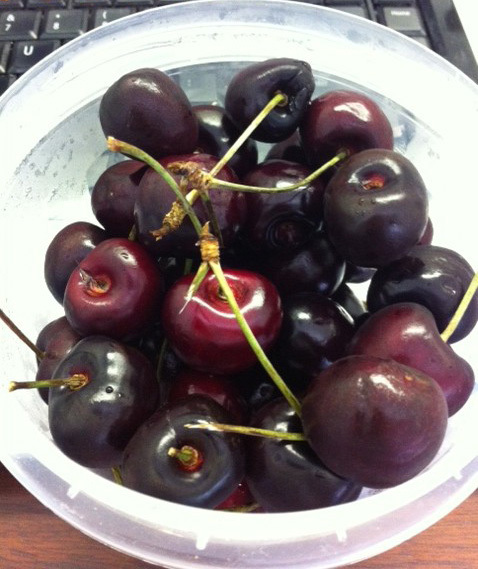 I have yet to get my hands on some cherries- needs to happen soon! I need to get some cherries stat – those look amazing! They make artic zero icecream bars? Where have I been. I must go find these immediately. I’ll be creeping all over whole foods and stuff. You always eat such yummy things. Cheers to cherries though. I’ve been gobbling those up since the summer started and they have been on sale! woooo! Omg your eats look so good! 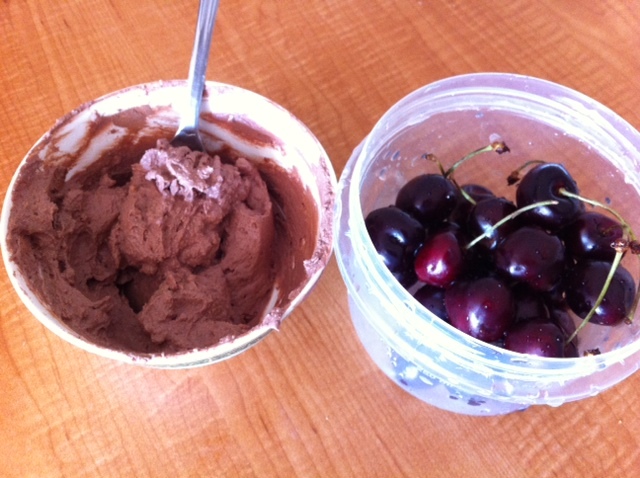 I love the pudding/cherries combination. Serious noms.